If you are new to Tecno products, then you have not seen anything yet. With a newer and fresher invasion, Tecno R7 has proven to be the piece of gadget that every phone freak should have. On this blog, i have featured quite alot of phones, among the list is the Nokia X Andriod device, the HTC One M9 and the Samsung Galaxy S5. Mobile phones (especially Andriod) seems to have overtaken the Blackberry market even if it has not totally silenced the Blackberry Market, but has muted its sales to some extent. The past few months has been so promising with Tecno. I remembered vividly, when Tecno product meant nothing to me until the company took the Bull by the horn by introducing interesting Gadgets. Some of the list included the M3, Phantom, A+,A3 and a host of other mobile devices too numerous to mention. With the release of the new Tecno R7, one can't help but toss such a valuable assets in his/her palm. With my little findings of the Tecno R7, i have been able to come up with some interesting facts about this mobile phone. Elevating the spirit of Andriod to another level, you will agree with me that Tecno R7 is worth giving a try. With features like 1.5GHZ Six core processor, 5.5-inch display, 4.2.2 Jelly Bean instead of Android 4.4.2 Kitkat,5MP front camera, a 13MP back camera, 16GB ROM, 2GB RAM, battery capacity of 2430mAh, Over-The-Air (OTA) software update and sports a modified user interface, the Tecno R7 would be a good alternative to any other device for now. I had to spot some specification which really interested me the more about the Tecno R7. As per the time of publishing this review, the Tecno R7 goes for the price of forty five thousand naira. If you stay in the UK or USA, you can get this gadget at the price of $2350 to $240 dollars. Of cause you can get the Tecno R7 on Konga.com or Jumia.com.ng. These are the most popular ecommerce platforms in Nigeria. Do wish to sell the Tecno R7 to a bigger audience? Then learn how to sell Tecno R7 Online. Would you love to get this phone? let me know via the comment box below. I really love to know what you think of this phone. Never heard of tecno R7 and it seems really awesome smartphone. 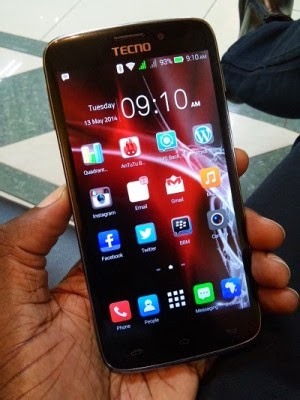 Awesome review of tecno mate, I wish I could be able to see the mobile smartphone personally. Seems I'm gonna have to take a look to the tecno r7 as this is the third review I'm reading this day. Please do. I will really love to hear what you think of the gadget too. It is lovely i know. Thanks for stopping by.